For the past couple months I have been struggling with depression. I have felt pointlessly floating through life and its daily tasks. I can’t seem to figure out a direction or purpose. And today I was finally able to pin point why! I think it was the only moment of truly clear, honest thinking I have had in the past couple months. Things have been so challenging for me because there will never be a “life after cancer”. All of the cancer blogs I read or cancer survivors I talk to speak of the challenges they face/have faced in figured out their life after cancer. I have been trying and trying different strategies that I have learned about and finally tonight it hit me…. This isn’t right for me. I am not trying to figure out my life AFTER cancer. This is not going to happen for me. I need to figure out how to life WITH cancer… forever. This has also made it clear as to why I dislike being called a cancer survivor. I really don’t feel comfortable being called this, or grouped into this category at cancer events, for example. This is not me. I have not survived anything. I actually liked quite a bit how the 40 under 40 article has me listed as a “cancer fighter”. Now this is a term that I agree with. I feel comfortable with it as it accurately describes how I feel and where I am at. So now I have identified that I have been thinking about my life and moving forward in the totally wrong way. I am not waiting for a “life after cancer”… that isn’t a reality for me. I need to stop waiting for this. I need to figure out how to LIVE WITH CANCER. If anyone knows how to do this I would love to know! 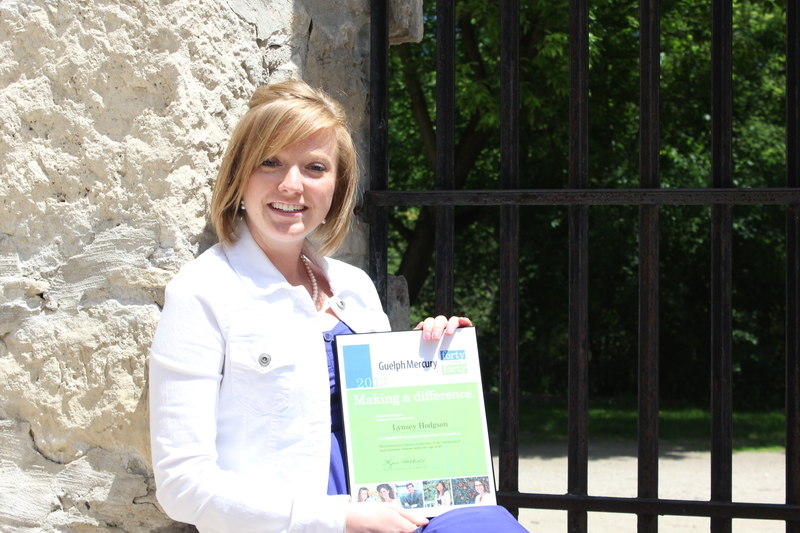 Earlier today I had the honour of attending Guelph 40 under 40 awards ceremony… as a winner! What an amazing event this was, one that will stay with me for the rest of my life. Five of my amazing friends, Lacey Scott, Becky Clark, Jen Braithwaite, Lori Samis, and Lisa Eveleigh, nominated me for this award. When I found out, I was shocked to say the least. It took me hours to read through the package they submitted about me… because what they wrote, and the letters of reference they had gathered, were so emotional and amazing to read. I had no idea of the impact that I have had… What I am doing through this blog, fundraising, and speaking events is just what feels right to me… I have been given this diagnosis for a reason and I am just doing what needs to be done. I am honoured that my closest friends think so highly of me. Thank you girls ❤ Thank you as well to Sharon Whiteside of the Brain Tumor Foundation, Dianna Landry, Craig Moore, and Erin Cage who all wrote touching letters of support. Sharon wrote about the fundraising I lead with the Firecrackers at last year’s Spring Sprint and the impact of my speech. Dianna wrote about the impact that I have had of her daughter Jenna, who donated her hair to cancer and creates the beautiful bracelets to raise money for the Brain Tumour Foundation and for me. Craig wrote about my fundraising efforts, positive attitude, and blog posts. Erin’s letter touched my heart the most as she spoke of how I have made cancer something that can now be talked about in her house. Her two step-sons lost their mother to brain cancer almost three years ago, and given their young age they didn’t understand the disease or what Mommy did wrong to get it. It was (and still is) amazing to read that in some small way I have helped them turn the awful experience they went through into a learning experience. They have been two of the biggest supporters of the penny drive because, in their own words “we want to give Lynsey the chance Mommy never had”. Thank you all for helping me see the impact I have had on you and your families. I read the package often, especially on bad days, to help brighten my spirits and encourage me. The ceremony today was amazing to be a part of because I was able to see all of the amazing work that is being done in our community. People were honoured for all sorts of things … culture, art, sports, fundraising, volunteering… and all of these people are making a difference in the community. It was a spectacular feeling to be up on stage with these award winners. Although, as I have told the 5 girls who nominated me, I don’t think I deserve this award I truly appreciate that so many people think so. I am happy that in some way I am having a positive impact. One final comment, I received the greatest compliment today. In the parking lot after the ceremony a lady came up to me and we chatted for a bit and as she was leaving said “It is so nice to know that you exist”. I thought that was amazing… it was so simple but said so much. 40 Under 40 will be published tomorrow in a special section of the Guelph Mercury. It will also be available online.